Mall of Africa is co-owned by two leading South African property companies: JSE-listed real estate capital growth fund Attacq holds the commercial development rights to Waterfall and owns 80% of the Mall of Africa; Atterbury Property Developments owns 20% of Mall of Africa and is responsible for the Mall of Africa development project, on behalf of Attacq. Mall of Africa will feature over 300 retailers, restaurants, entertainment and services. It also has all amenities that shoppers may need. Atterbury Asset Managers is responsible for Mall of Africa’s asset management for its co-owners. 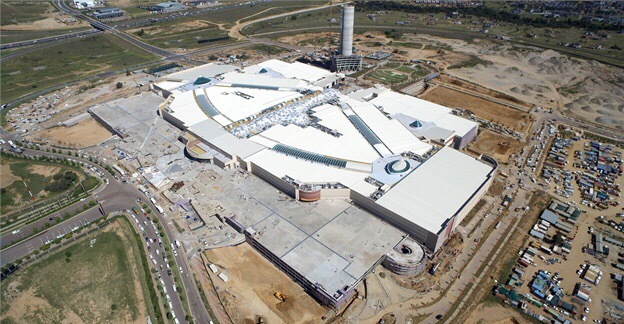 Atterbury began the construction of Mall of Africa nearly three-and-a-half years ago, on 28 October 2012. While the mall comprises some 130,000m² of gross lettable area, James Ehlers, MD of Atterbury Property Developments, noted that its construction area covers 550,000m² – or 78 rugby fields. A stroll around the building’s perimeter will take you on a walk of 1.75 kilometres. Ehlers also reveals that over six kilometres of shopfront has been created inside the Mall of Africa. More than 530 kilometres of post tension cable has been used in its construction, as well as 18,500 tons of rebar and 205,000 cubic metres of concrete. During the construction of the Mall of Africa, 3,078 people were employed for the project and, by January 2016, they had worked 10.41 million man hours. “When the centre opens, hundreds of permanent and part-time jobs within the centre will be created on a sustainable basis,” said Ehlers. A mall of the magnitude of Mall of Africa has massive pulling power for shoppers in the region and beyond, driven by its distinctive retail experience across two levels of exceptional shopping. Lucille Louw, MD of Atterbury Asset Managers, confirmed that the Mall of Africa will open with seven anchor tenants and an array of international retailers that have chosen to debut their brands to South Africans at the mall, as well as an appealing line-up of flagship stores for all major South African retailers. “Mall of Africa’s carefully considered retail mix creates a unique experience that is a major attraction. It offers a well-balanced variety of local and international brands, services, speciality shopping, entertainment and eateries. There will be something for everyone, with 2.4 kilometres of shopping and an exciting selection of 300-plus stores,” said Louw. Anchor tenants at the Mall of Africa include Checkers, Edgars, Game, and Woolworths. They will be joined by leading South African brands from The Foschini Group, Mr Price and Truworths. Louw revealed that top international brands opening their first stores in South Africa at the Mall of Africa include: Armani Exchange, Helly Hansen, Asics, Zara Home, The Kooples, Under Armour, Mango Man, women’secret and the Amsterdam-based Soap Stories. These new retailers opening in the country for the first time will join a full pack of favourite brands like: H&M, Forever 21, Forever New, River Island, Mango, Starbucks, and Versace. One of the many leisure highlights at the Mall of Africa is a magnificent outdoor park with a children’s play area featuring an interactive musical water fountain. A major benefit of the Mall of Africa is its central location in Gauteng and easy access from all areas. It is situated in Waterfall City, halfway between Joburg and Pretoria. It is highly accessible, located adjacent to the Allandale Road exit of the N1 Highway, the first free-flow intersection of its size in Africa. Atterbury has undertaken major road upgrades around the development to make it easy for shoppers to arrive at the Mall of Africa’s 26 entrances. The mall has around 6,500 parking bays, most of which are undercover. It also offers valet parking, special drop-off facilities for buses and dedicated Uber pick-up and drop-off points – a first in the South African retail environment. It is also minutes away from the Gautrain Midrand Station. The project implemented multiple green technologies, including a massive photovoltaic installation on the roof of the Mall of Africa. The installation will be the largest in Africa and will provide 4.8MVA of sustainable power for the centre. The mall will use grey water harvesting in all public toilets and for the irrigation of the entire development. Its design means natural light is maximized in the mall in such a way that shopper comfort is also optimised. Posted on April 5, 2016, in #retail, #southafrica. Bookmark the permalink. Leave a comment.